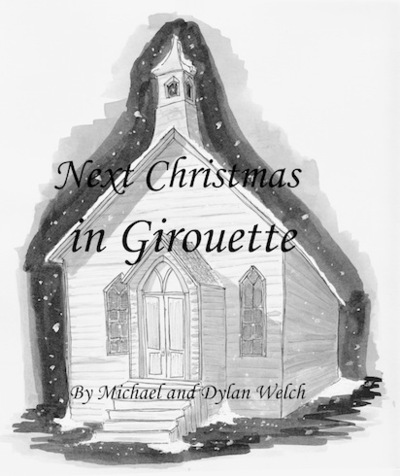 Next Christmas in Girouette… is a full-length novel for people of all ages—nine to ninety-nine—who want to share a heart-warming literary adventure at Christmastime. Set on the eastern slopes of the Rocky Mountains in Montana, this is the story of a brother and sister—Autry and Oxana Quinn—who find themselves stranded in a Girouette, a virtual ghost town, from Thanksgiving through Christmas when their father is taken ill. Their grandfather, a Marine Captain long retired, plus an eccentric old café owner, a Blackfeet Indian horse trader who was once the town’s mayor, a couple who published the local newspaper and an ancient deaf-mute trapper are the only remaining inhabitants of Girouette. These self-styled “diehards” all seem to have one thing in common. Thanks to a mysterious event 60 years earlier, they still believe in Santa Claus. Next Christmas in Girouette features something for everyone: carefree cowboys who race their horses over snow-covered country roads, a team of wolves trained by a mountain man to pull a sleigh, a stroll that nearly turns tragic on a treacherous buffalo jump, a serialized newspaper story titled “The Adventures of Rocky Mountain Santa,” a desperate attempt to escape from an abandoned copper mine, a night-time journey through the mountains on a frozen river and finally the miracle that delivers wayfaring strangers to Girouette during a white-out on Christmas Eve. The book revels in the solitary beauty of winter in Big Sky Country, the enduring wisdom of the elderly citizens of Girouette, the excitement of frontier history coming to life, the inspiration of a family healing itself and the magic of an old-fashioned western Christmas. Read Next Christmas in Girouette with your family this year, and you’ll want to revisit it for years and years to come at holiday time. Autry and Oxana were tired but happy as they ran across the street through the falling snow to the Dispatch Building for what had become a routine visit with the deSpains. When the kids entered the deSpain’s parlor, they saw another big armchair had been placed in front of the fire with its back to them. As they approached Edgar deSpain, who was sitting where he had been the day before, a man arose from the other chair and turned to greet them. The children gasped. The man, who stood even taller than their grandfather, The Captain, was dark and brawny with long, thick, gray hair tied in a ponytail and a large scar on his cheek. 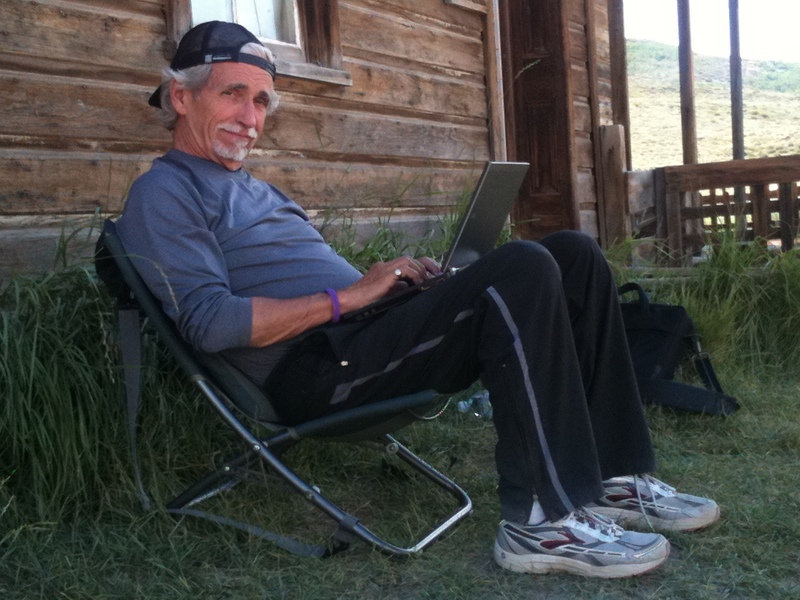 “Oxana, Autry… this is Ron Running Elk,” Edgar said. The man stepped away from his chair and shook Autry’s hand very formally, then bowed to Oxana. He was like a king from a distant country and an earlier time. Joe offered everyone fresh cowgirl cookies with red and green frosting. Edgar smiled and continued reading from the Dispatch. “Fortunately, Santa Claus is an honorary pipe holder in the Blackfeet tribe. He knows all the elders and he’s on good terms with the medicine man. At least, he thought he was on good terms with him. With less than three weeks to go before Christmas, Santa flew over to the reservation last night for a private powwow with the medicine man, whose name is Charley Horse. Now, Charley Horse still practices the old ways, which means he lives in a teepee. Santa was dreading his meeting with the medicine man, because he hates to sit on the ground. After an hour of sitting on the cold ground, it’s very hard for Santa to stand up again. “For three hours, Santa sat there smoking the peace pipe with Charley Horse and listening to the medicine man go on and on about all the particulars concerning how the presents would be delivered to the children on the reservation. For instance, the presents were supposed to be handed in through open windows—not dragged down the chimneys—and placed in straw baskets, not gift-wrapped. That was fine with Santa, of course. Furthermore, none of the children would be expected to leave cookies for Santa. Now, this was the burr that got under Santa’s saddle. The Blackfeet children would leave mule’s ear biscuits for their benefactor the medicine man insisted, along with raw prairie dog livers. “Talking about raw prairie dog livers was beginning to make Santa dizzy, as was sitting in Charley Horse’s teepee while it filled up with smoke from the medicine man’s powerful tobacco. ‘Look,’ said Santa, ‘the truth is I got me a tender stomach. There’s certain things I cain’t tolerate, an’ liver’s at the top of the list. I don’ even eat liver when Mrs. Claus fixes it—chicken liver that is—so I’m sure as shootin’ not gonna be able to eat….’ Santa couldn’t even bring himself to say ‘raw prairie dog liver’ for fear of losing his lunch in Charley Horse’s teepee. “‘Because, we are hungry,’ said Charley Horse. “‘Well, I ain’ that hungry,’ said Santa defiantly. “‘Then you’re not going to deliver presents to the Blackfeet children,’ said Charlie Horse imperiously. ‘Now, I will show you to the flap.’ He strode over to the flap of his teepee and dramatically threw it open for Santa. Oxana and Autry were not sure whether they should laugh or not. The story seemed to be disrespectful of the Blackfeet culture. Then Ron Running Elk burst out laughing. Edgar, who was a master of keeping a straight face, continued reading. “Although Santa wanted to be friends with Charley Horse, he could see that negotiations with the medicine man were over, at least for the time being. Santa raised his hand half-heartedly in peace to Charley Horse, who raised his in return, then walked over to his sleigh where he had left it in a meadow near the medicine man’s teepee. Edgar looked up mischievously at Oxana and Autry, then he continued. “’On Dancer! On Prancer!’ Santa shouted. ‘On, Donner and Blitzen. Get the lead out!’ With the next crack of his whip, the reindeer started running across the meadow, but they were unable to gain altitude. Instead of rising up into the air, the sleigh bounced violently along on the ground, knocking off Santa’s cap and tossing him from pillar to post, almost pitching him out onto the ground. It was as if there were eight bucking broncos hitched to his sleigh. With no chance of flying, his only objective was to remain upright. At the far end of the meadow, he pulled back on the brake with all his might and the sleigh ended up sideways in a thicket of prickly pear trees. When he tried to climb down from the sleigh, the reindeer lurched forward and threw Santa into the prickles. His Christmas spirit was at an all-time low as he made his way out of the thicket and began to inspect his reindeer. He looked into their eyes. He examined their hooves. He saw that they were breathing heavily, but there was nothing he could see that was wrong with them. Of course, it was the middle of the night and dark as a coal mine. “That’s right,” said Edgar, then went on reading. “As Santa expected, he found a bell hanging from every reindeer’s harness. After he collected all eight bells and crushed them under the heels of his cowboy boots, Santa was immediately able to coax his chargers back into the air. He buzzed Charley Horse’s teepee at about 30 feet. When he tilted the sleigh and looked down, he saw the old medicine man looking up at him, smiling and waving. He was wearing Santa’s hat! “Now, when Santa is angry, he chews on the tip of his beard. By the time he got back to his headquarters in theRockies, his beard was two inches shorter. Early the next morning, he told his head elf, Mr. McNish, to summon all the elves from the Cowboys and Indians Division for a production meeting. ‘I want ya to prepare fer a major retoolin’,’ he told them. ‘From now on, I don’ want no games where cowboys an’ Indians are killin’ one another. In fact, we’re gonna stop manufacturin’ six-shooters, tomahawks, bows an’ arrows an’ all that kinda thing, at least here in the West.’ The elves were clearly disappointed. Everyone, including the elves, liked to play ‘Cowboys and Indians.’ Santa was undeterred. “After the production meeting, Santa summoned his head elf, Mr. McNish. Santa sat down at his desk, very gingerly, pulled off his cowboy boots and was about to throw them into the corner when he saw one of Charley Horse’s magic bells wedged against one of his heels. This book is available to e-readers on Amazon’s Kindle and Barnes & Noble’s Nook. It is also available to read on Smashwordsand to hear (the author reading) on PodioBooks. Sample the audio version at http://dl.dropbox.com/u/40062995/Girouette%2001.mp3. Michael’s younger daughter, Dylan, illustrated the book drawing upon a visit with her father to a ghost town in the California Sierras called Bodie. His older daughter, Kat, is doing the PR for the Next Christmas in Girouette. Visit Michael online at http://girouettechristmas.tumblr.com/. A beautiful telling of the Christmas story. Moving music to accompany the story. 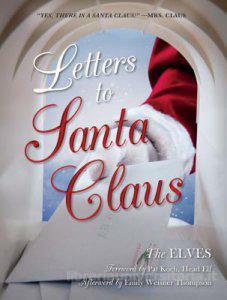 Also, a touching play for churches and organizations to put on during the Christmas season. 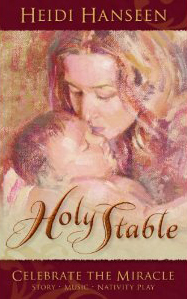 All this and more is what you’ll find in Holy Stable: Celebrate the Miracle by Heidi Hanseen. I wasn’t quite sure what to think when this small booklet with its stunning cover art arrived in its plastic sleeve. First, I read the lyrical story of that first Christmas. How the angel Gabriel visited Mary to announce she would bear God’s Son. Then Mary and Joseph traveling to Bethlehem to be taxed and finding nothing more than a mere stable. The story then speaks of the young couple as Mary labors, and the birth of the King. It ends with the shepherds and the Wise Men coming to witness “Heaven’s gift from above.” Several striking photos appear with the story. Also included with the booklet is a CD that includes four versions of the music. In addition to the first two version that have the words, this CD has an instrumental version for your own vocals and actors, and an instrumental version with cues to simplify timing for your narrator. I listened to all of them, because they are beautiful. Within the final pages of the booklet you’ll find a glossary, which can help the producer of your Nativity play explain certain words from the script to younger cast members. This is a truly beautiful package that will help you, your family, and your church celebrate the true meaning of Christmas. Highly recommended! 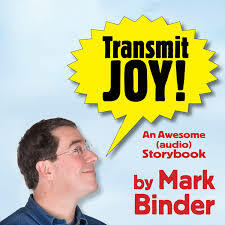 I received a FREE copy of this booklet and CD from the author in exchange for my honest opinions. I received no monetary compensation of any kind for my review. 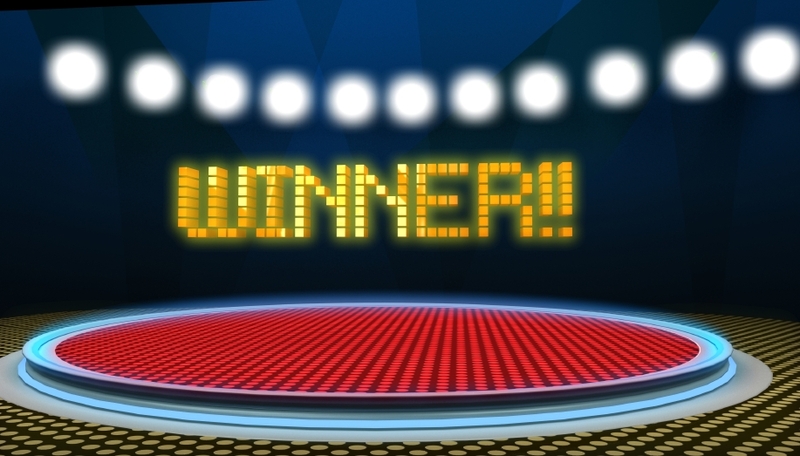 Congratulations go out to Beverly, our winner of a copy of Other Goose by J. otto Siebold. I’ll contact Beverly now to get her mailing address. Thanks to all who participated. Look for more giveaways coming soon! From the author of Olive, the Other Reindeer comes a rhyming collection of updated Mother Goose rhymes for the modern reader. See Humpty Dumpty, Jack and Jill, Little Boy Blue, and other favorite Mother Goose characters like you’ve never seen them before when you open the pages of Other Goose: Re-Nurseried!!! and Re-Rhymed!! Children’s Classics. As I was working through Picture Book Idea Month in November, I thought about new twists on nursery rhymes. So, when the chance to review J. otto Siebold’s new book, Other Goose, I was eager to get my hands on it. This is a funny, colorful book filled with favorite characters in all new scenes. Humpty Dumpty’s story is told in four parts, Jack and Jill have a new friend named Bill, Little Boy Blue is going to blow his tuba, and the little old woman who lived in a shoe has now moved into a sneaker. Couple these new rhymes with Seibold’s vivid and zany artwork, and you’re sure to have a book that kids will enjoy. HERE’S HOW YOU CAN WIN A COPY OF OTHER GOOSE BY J. OTTO SIEBOLD! 1) Leave a comment with your email address (so we may contact you if you win). 2) Get one additional entry by becoming a subscriber of The Children’s and Teens’ Book Connection. Be sure to leave us a comment to let us know. 3) Get one additional entry for liking Chronicle Books on Facebook at http://www.facebook.com/ChronicleBooks?ref=ts&v=wall#!/ChronicleBooks. Be sure to leave us a comment to let us know. 4) Get one additional entry for following Chronicle Books on Twitter at http://twitter.com/ChronicleBooks. Be sure to leave us a comment to let us know. Deadline to enter is 11:59 PM Eastern on Sunday, December 12, 2010 . Winner must be a resident of the United States or Canada and have a mailing address in one of those locations. Christmas delivery is not guaranteed. The Children’s and Teens’ Book Connection is not responsible for lost or damaged goods. Clara Barton, West Point, the Gulf War, Labor Day, trains, mosquitoes, the Kentucky Derby, The Wizard of Oz and the Girl Scouts. What do these things all have in common? These people, places, things and many more can be found in Kenneth C. Davis’s latest book, Don’t Know Much About Anything Else. A fun, easy and interesting way to learn more about the world we live in and the people who have made a difference. Teachers could use this book to encourage a love of learning in young people and readers will enjoy testing their family and friends about what they know. There’s only one problem with this book–it’s addicting. I can’t wait until Davis comes out with another Don’t Know Much About title.